What Exactly is a Hit and Run Accident? When you think of hit and run accidents do you imagine a vehicle speeding through a red light, striking a pedestrian, and zooming off? There are hit and runs where someone is bodily injured, but it is more likely to be someone hitting a parked car and driving off. You have probably broken something, or even clogged a toilet, at some time and slunk away. No one wants to fess up. Maybe there were no witnesses. It’s a natural response to conflict, punishment, or negative experiences to want to flee. It is also highly illegal. More than 1 hit and run accident occurs every minute in the U.S.
20% of pedestrian deaths in the last 10 years were caused by hit and runs. 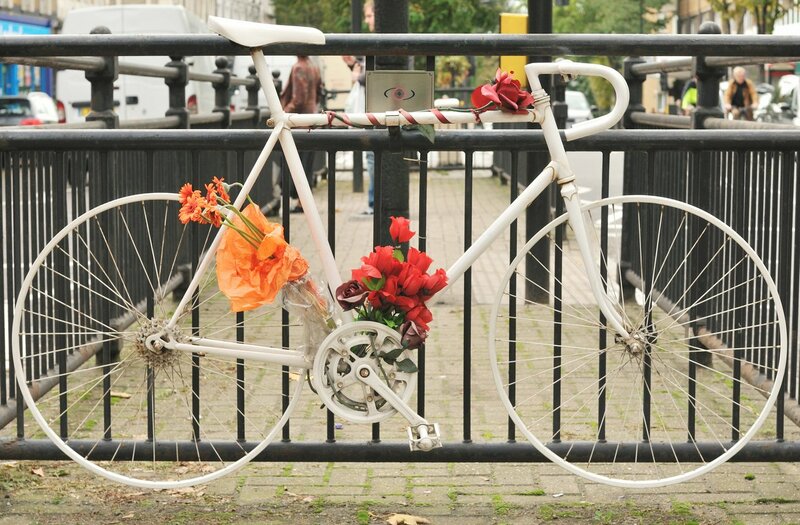 "Ghost bikes" are memorials for fallen bicyclists. 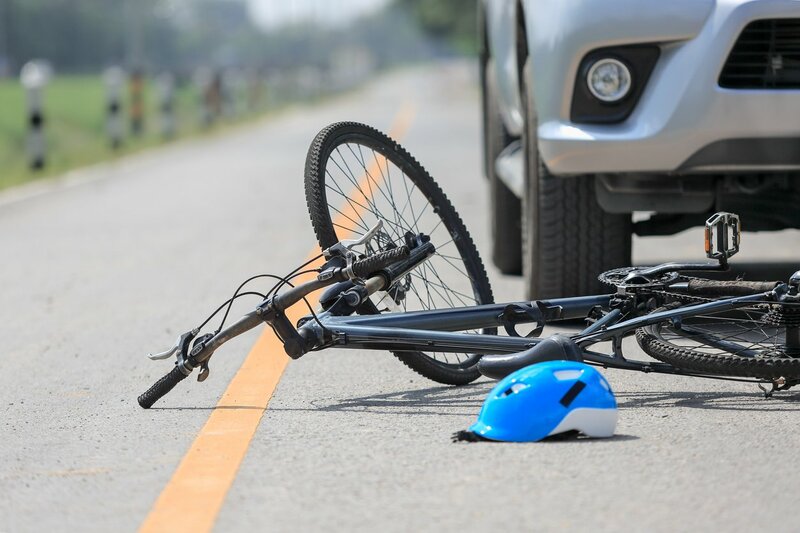 More than two bicyclists are killed every day in the U.S.
Hit and runs include any accident where a vehicle hits a person, object, or vehicle and the driver knowingly leaves the scene without providing their information. There is an exception for property and vehicular accidents if no one is around. If you leave your information and file a police report, it’s not a hit and run—even though you leave the scene. Most states consider an accident a hit and run even if the accident does not occur on a road or highway. 69% of hit and run claims involved parked cars, Allstate reported in 2010. Given the increase in accidents overall, this number has undoubtedly gone up since then. Do not leave an accident scene! Like parents tell children, hiding what you did will get you in more trouble. A hit and run may not be your fault. However, leaving the scene of the accident can be a crime itself. Leaving the scene can lead to extra or increased charges, points on your record, fines, suspended licenses, and even jail time. In addition, penalties could include getting special SR-22 insurance. That’s the same insurance associated with DUI’s. SR-22 insurance is very expensive and required for 1 to 10 years. 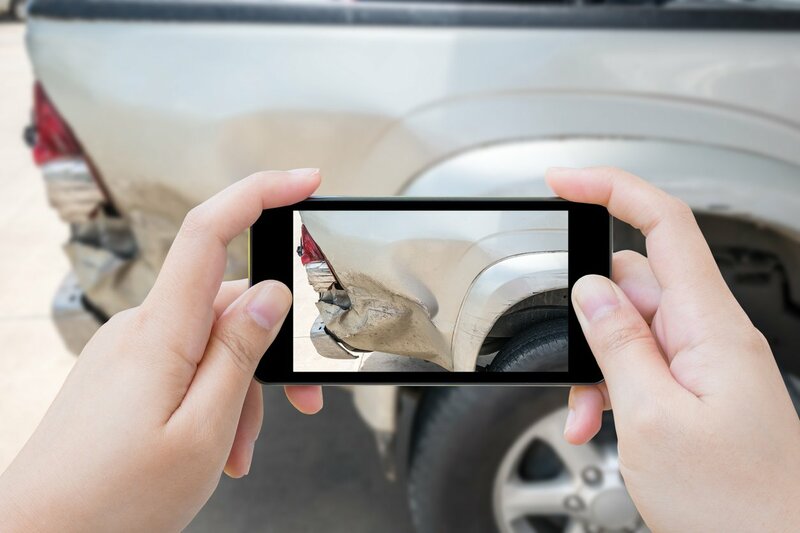 What to do if the accident only involves another vehicle or property damage. Take photos of the damage and leave your information at the scene. Stop and assess the damage. See if you can find the owner nearby. Take photos of the damage and scene. Vehicle: Note the license plate, make, and model of the vehicle. Property: Take down the address or location and maybe a few notes on the description. Affix a note with your information to the damaged object. Leave your name, phone number and/or email address, and license plate number. You may also want to file a report with your insurance. It can happen to anyone. You are driving along and suddenly someone steps into the street. Or, you spill coffee on your lap and don't notice the bicyclist who just turned into the roadway in front of you. It is a terrifying scenario. But, if it happens, stay calm and handle the situation. Accidents happen. Don't drive away. If you are involved in an accident with a person, stay on the scene. Wait for the police. If there are evident injuries call 9-1-1 for help. When involved in an accident, failure to act that results in increased injury to the victim can lead to harsher charges, including vehicular manslaughter. If you are the cause of injury, you have a duty to rescue or help the person if safely able. 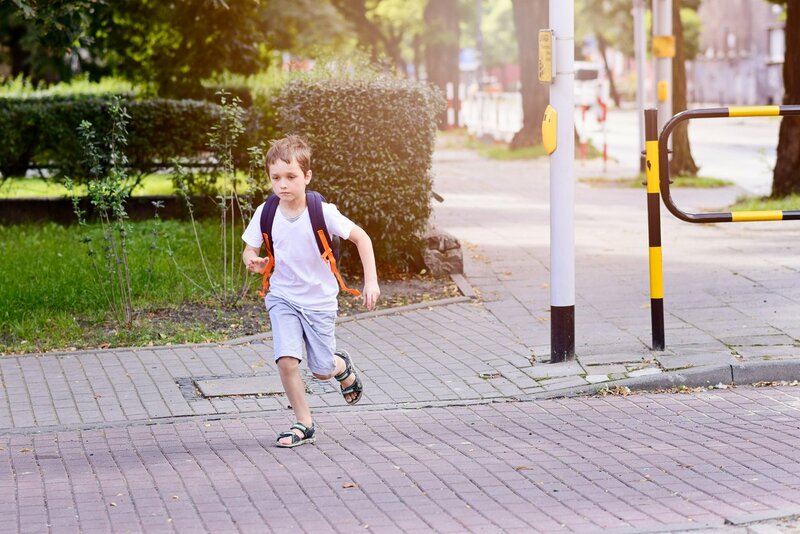 Temporarily leaving the scene of an accident to get help or increase safety is not usually considered a hit and run provided you return to the scene. If your car is in a dangerous place you can move to the shoulder or nearby parking lot. Or, if someone is hurt and you go for help (or for cellphone reception) that is also not considered a hit and run. Hit and run laws vary state to state. They can be traffic infractions, misdemeanors, or felonies depending on the severity of the accident, total amount of property damage, and cause of the accident. You can bet that the consequences for a hit and run are much worse than stopping and taking responsibility. Stay aware of the road in front of you. You may think getting away with it is better. But you really didn’t get away from the consequences. Consider parking lot cameras. Or, the witness you didn’t notice. In one case, a dog was hit and the owner reported damage from hitting a deer instead for insurance. Pieces of her car at the scene lead back to her. That leaves room for a number of charges including filing a false report, failing to report, and leaving the scene. Another consideration is your insurance. A hit and runs incur higher criminal penalties, perhaps leading to jail time or suspended licenses, than an accident where you stop. The same applies to your insurance. Expect a hit and run insurance increase that is far worse than properly reporting. If you try and cover an accident with a false report (like the woman above), that can lead to insurance fraud charges. Is it a hit and run if I hit an animal? There are an estimated million animals killed on American roads every day. It is still a hit and run if you do not stop and provide information or report the incident. What should I do if I hit an animal? Make sure your car is safe, moving it out of the road if necessary. Turn on your hazard lights or set up road signals. Call the police or emergency services. If you kill a small wild animal, like a squirrel or skunk, you don’t have to call the police. Try to avoid injury to you or the animal by moving it before help arrives. Hurt animals can be dangerous, so do not approach them if it seems unsafe. Take photographs of the scene for insurance and police reports. If it’s a deer, livestock, horse, or other large animal then it’s likely your car took damage. What happens if I hit an animal? Most often, the driver will not be found “at fault” unless the accident happened because of their negligence. Whether it is a neighborhood pet, livestock, or a wild animal you must stop. Hitting an animal and not stopping is classified as a hit and run in most states. Exceptions are for small wild animals and birds. However, you should move the body so scavengers aren’t drawn into the road. Laws about hitting animals vary state to state. No matter where you are, stopping is a good idea. 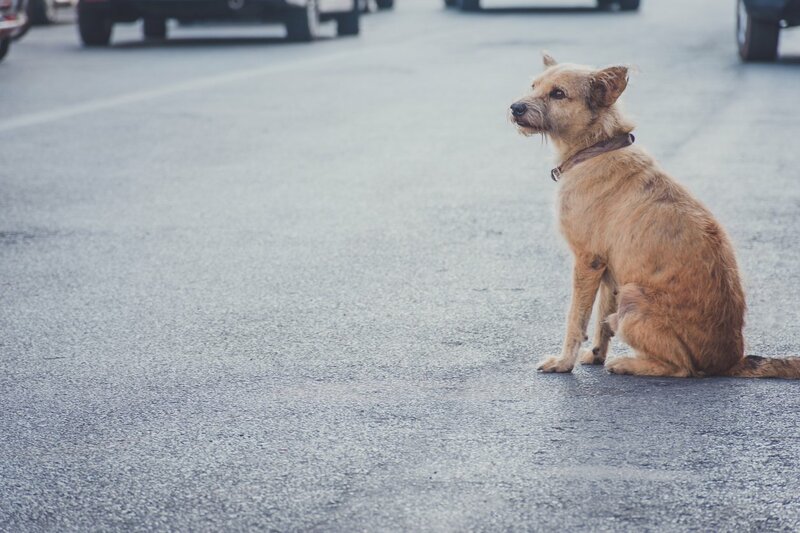 Leaving the scene can still lead to charges in states without animal hit and run laws. Charges can include animal cruelty, failure to report, or ignoring leaving information as you would with property damage. Animal cruelty can include directly causing harm or failure to act. Hitting a domestic pet, horse, or livestock animal without stopping, helping, and reporting “property damage” is a misdemeanor in California. In California and some other states, pets are legally regarded as property. Pet owners may file civil suits for wrongful death, animal abuse, or property damage.